Sewing has so many different methods. It is OK if you don’t know them all, but if you work in the apparel industry it is a good idea to at least know some of the basics. Today, let’s take a moment to learn a little more about the meaning and process of bartacking. What is a bar tack stitch? A bar tack stitch is basically a tight zigzag that is repeated back and forth over itself to reinforce a piece that is sewn together. In sewing, bar tack, also written bar-tack or bartack, refers to a series of stitches used to reinforce areas of a garment that may be subject to stress or additional wear. Typical areas for bar tack stitches include pocket openings, buttonholes, belt loops, the bottom of a fly opening, tucks, pleats and the corners of collars. They are potentially used in other locations of clothes, footwear, and fashion accessories as well. Bar tacks may be sewn by hand, using whip stitches, or by machine, using zigzag stitches. The process for sewing a bar tack is essentially to sew several long, narrowly-spaced stitches along the line of the bar that will be formed, followed by short stitches made perpendicular to the long stitches, through the fabric and over the bar. The bar commonly varies between 1⁄16 to 1⁄8 inch (1.6 to 3.2 mm) in width and 1⁄4 to 3⁄8 inch (6.4 to 9.5 mm) in length. In some garments, such as jeans, the bar tack will be sewn in a contrasting color. Similar stitches to the bar tack include the arrowhead tack and crow's foot tack. Chances are that if you've ever seen a pair of blue jeans, you've seen a bartack. Learn more about sewing in our education section. You may want to go specifically to the seams & stitches section. The machine achieves sewing speed of 3,200sti/min. The machine's starting, stopping, thread-trimming and automatic presser lifting speeds have been increased to significantly shorten total cycle time. 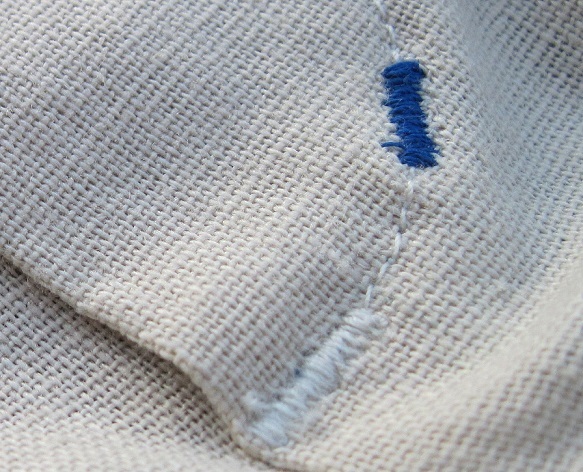 Learn more about bar tack stitches in our apparel definition section. You can learn more about the above mentioned equipment at the Juki sewing machine website. If you are a fashion designer that prefers to sew by hand, you are welcome to buy needle and thread and work on your sewing techniques by hand instead.